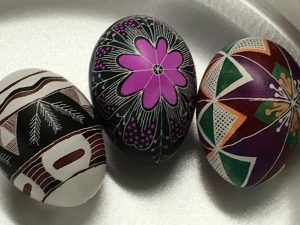 Ukrainian Egg dying with Amanda Pruneda - Steph's Studio Inc. Call today to reserve your spot. Limited seats available! Who: Anyone who loves to create something beautiful to keep. What will we do: Amanda will demonstrate how to use wax to create a work of art on a chicken egg and make it into a wonderful ornament. What to bring: Apron and clothes that you do not mind getting messy in. The dye used in the process is permanent and can stain fabric. A pysanka (Ukrainian: писанка, plural: pysanky) is a Ukrainian Easter egg, decorated with traditional Ukrainian folk designs using a wax-resist (batik) method. The word pysanka comes from the verb pysaty, “to write”, as the designs are not painted on, but written with beeswax.